On Friday, I went on a mountain bike ride with some friends from work, and some of their friends. Get enough geeks (both nerdy technical types and bike geeks) together, and who knows what will happen. It was... certainly interesting. It started out with Josh asking if I wanted to tag along with he and one of his friends from Utah. It ended up as eight of us threading our way through one of the fairly popular riding tracks of the area, owned by a local church, with trails built as an Eagle Scout project (and kudos to who ever that was -- well done!). I'm a pretty strong rider... Road rider. My offroad skills are a bit lacking. And when the bike is rebelling, it doesn't help. Okay, so now I have to provide some back-story. Josh and I have been doing lunchtime rides at work for some time. He doesn't ride the road, but the riding on the "trails" around our work site are more fire and service roads -- not much in the way of technical challenge. And that's just fine with me. I'm more after a workout. We've exchanged various bike parts as well, digging through the archeology that is our respective garages when the other needs something. A bike symbiosis of sorts. I'd had a mountain bike frame collecting dust in my garage for some 6 years. 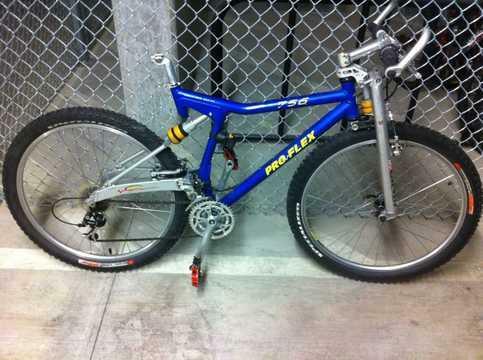 A Proflex 853 (similar to the one pictured), 1993 model bought new in 1994, with upgraded Girvin forks. Awesome suspension at the time, and still quite good by modern cross-country standards. It used a foam elastomer for both the spring and damper on the fork and rear suspension, and functioned very well... until one winter it went rock solid. Now I hadn't been riding on it, so it did so without me noticing. And from that point on it sat. I tried to get replacement elastomers through K2 (the company that bought out Proflex), but it seemed that the entire concept had evaporated. None to be found. I scavenged bits off the bike, eventually using most of the parts to build up my current single speed MTB that I keep at work. I gave the frame to Josh some time back, and he replaced the rock-elastomers with springs, and then built up the rest of the bike to be serviceable. Since I knew the area we were going to be riding on Friday wouldn't be so kind to a rigid single speed, Josh offered to let be borrow the old Proflex. I made some comments about maybe wanting to buy the bike back from him after the ride, just to have some suspension again. And this is where the bike started taking revenge on me, for the years of neglect, for giving it away for nothing, and maybe most of all for giving up on it. But wait, there's more. I found out very early that I couldn't get the rear shifted onto the biggest cog. "Limit screw adjustment" I thought, and told Josh as much. I could finesse it onto that cog, but it wouldn't stay -- as soon as I released the pressure on the shifter, it dropped back down. About 4 miles into the ride, I relented and asked for a multi-tool so I could adjust the derailleur. That's when I figured out it wasn't the derailleur. It was the shifter. Or more properly, the cable adjustment to the shifter, which was one click off. meaning the shifter thought I was on the largest cog, when actually I was one away, and though the shifter has extra throw, it doesn't have a "click" to hold it there. So I was almost to a single speed anyway. Also, I mentioned the springs in the suspension. Did I mention the dampers? Of course not, there were none. What happens with an undamped suspension? It takes the hit, absorbs it, and then throws it right back at you. I ended up stading for much of the ride. Oh, and Eric and I had done a 5 mile run at lunch... My legs were feeling it. Oh, don't call yet, there's more. So since I was standing a lot, I kept hearing a squeaking and thumping in the bottom bracket area. Josh said it was a shimming problem with the bottom bracket, and I thought nothing more of it. Until well into the ride. I felt my left foot kind of loose, like it was moving around in ways it shouldn't. I checked the pedal -- tight. I rode on. It got worse. Then, out of curiosity, I checked the crankarm. Yup... Loose. At least the bolt was still there. Gotta love ancient square-tapered crankarms and bottom bracket spindles. It had gotten loose enough, and I'd ridden on it enough, that the tapers had deformed, and there was no way it was going to tighten properly. I think I stopped every half mile to retighten it, in hopes that I didn't lose parts along the way. At this point, I asked how far we had to go to get back to our starting point. The response? "I'm about 80% sure we have between one and ten miles to go." And this was the guy that knew the area the best. We'd been weedling through trails that would resemble the Gray's Anatomy of the small intestine on a map, and no one had a clue where we were. Awesome! We finally did make it back, and there wasn't much blood. No triage needed. We loaded up the bikes, me gladly handing over the Proflex to Josh, who put it inside his CRV along with 4 others, and Eric, Pat and I went to the Swing Arm Pub for some much-needed food before I got back on my motorcycle for the ride back home. So, in spite of all that, I had a lot of fun. I'd do it again tomorrow. But on a different bike. My wife and I timed another event this morning -- the Seattle AIDS Walk and Run 5K. As events go, it went pretty smoothly. There were TONS of volunteers, and they wanted to do everything off of gun time. I'm a big proponent of this. Chip timing may be of great interest to people who line up well back of the start line, and may take a couple minutes (or more) to cross that start line. For those at the pointy end of the pack, it's actually a sticky issue. Imagine this -- some one starts 5 seconds behind you, sprints up (well, they wouldn't even have to sprint) to your shoulder just after the start and stays just ehind you for the rest of the race. By chip time, they'd be 4 seconds ahead of you, even if they finished behind you. This is why, when we start events, I always call anyone who considers themelf fast to come to the front, any one who is vying for an overall or AG placing. Because I kind of think it's cowardly to win on chip time. Hey, if you wanna run with the big dogs, have the balls to get up there that at the start. No sneaking in the back door. But back to this morning's event... The start and finish were at different locations, though they were within loud-speaker reach of each other across the park. We had three watches coordinated to exactly the same time. Well, as exact as you can get with "hand" coordination. One of those watches was at the start line, with the instructions, "If you can't start right at 10:00, then do it at a whole minute, like 10:01 or 10:02." With the gun time results, there was no need for us to be at the start line. Well, as we're finalizing everything at the finish, I hear a countdown start... "Five... Four... Three..." I glance at my watch and see 9:52. What's going on? "Two... One..." then the blast of a horn. I look at my wife, and she has the same puzzled look. I head over to the main area, and ask some one... "I think that was the start." Granted, the file I build is a back-up system. Actually, it's a second back-up. So if I miss one or two along the way, chances are the chip system got them. But what amazed me is the number of people who bandited the race. No number at all. Nada. Nowhere. Now I know bandits happen. People will come to run a course for which theyh know the exact distance. And I don't have too much of a problem with that, IF they don't go through the finish line. If they DO, though, what they're doing is taking my attention away to try to get their number, and possibly missing some one who DOES have a number in the process. It's disrespectful. And in an event like the one today, which was a freakin' BENEFIT event for AIDS support... Well, I just have one question: If you go to an event like this in support of a cause, but don't pay for your participation, how are you really supporting it? If that's you, stay home next time. Okay, rant off. Time to sleep for the early risin' in the morning to time another race. So today I officially enter the "upper 40's". Can't even call it mid-40's any more. This weekend was a little different. Didn't do a single run, ride, or swim... Well, I did a ride, but on my motorcycle. Doesn't really count. Saturday morning, we timed an open water swim. One- and two-mile races, and let me tell you, the lead 2-mile swimmer was FAST. Looked like he had a motor. Just incredible. And it rained the whole morning. Made for a not-so-nice time on the shore with the timing equipment. That afternoon, I met up with some other local motorcycle riders for a "Maintenance Meet-Up". At first, with the way the morning went, I wasn't so sure I would go. But I'm glad I did. Full brake bleed, new pads, and stainless steel lines on the front. I was glad to have knowledgeable help doing this for the first time. Thanks to Travis and the gang for all the help! And yesterday, we went for some Lazer Tag. Which is an amazingly deceptive workout. I didn't really feel the effort, but I was drenched in sweat at the end of the second 15-minute game. It was a lot of fun. Today, back to work. Do I feel a year older? Not really. Of course really I'm only a day older than yesterday. Not quite to the next age group, and my run is still getting faster. Look out. Well, it seems summer is over in the Seattle area. All three weeks of it. In a matter of 3 days, the temperatures have dropped from the low- to mid-80's to a projected high of 63 today. I've missed a couple workouts this week for scheduling issues. One of them was a dentist appointment -- my gums got a workout instead. But on my run Tuesday, I was impressed with how different it felt to be running under a cloudy sky. It's amazing how quickly I got used to the nice weather, almost expecting it to continue. A couple years ago I was spoiled by a summer that arrived in mid-June and stuck around into mid-September, with high's in the 80's (and above, some days well above) almost every day. I was joking with Eric about needing long sleeves. I mentioned to him about doing the trail 10K on October 23rd, and he suggested that I do the Seattle Half-Marathon in November (the Saturday after Thanksgiving). I said, "That's too cold! I'd have to wear 4 layers!" Last year it snowed the week before the race. Race morning was something like 27 degrees. I'm very much a warm-weather runner. Not that I don't run in cold temperatures... I just prefer running in warm weather, where I can get by with the three S's -- shorts, shoes, and socks. And when it comes to racing, I like a range of mid-60's to mid-80's (with a preference to the upper end of that range). Sunday morning I was sitting there, contemplating my run for the morning. How far? Take Jake with me? Between the three distances, there were some 200+ finishers, and no heat emergencies. Finish times were slow -- 3:15 for the marathon (second place was a woman only 4 minutes later), 1:27 for the half (posted by a woman -- first time I've seen that first hand), and 44:15 for the 10K (a guy pushing a stroller). Yes, the heat definitely affected those times, but I guess I'm just not used to small races and their accompanying soft winning times... You'd think I would be by now. Especially after seeing winning 5K times around the 20 minute mark. Anyway, as we were setting up for the race, I tweaked something in my lower back. Still hurting. So I was contemplating the run, and the day of house painting after... We'll see how it goes, I think. I suited up and decided to run solo. Within a few steps I knew it wasn't going to be good. Legs felt weak, and the back was hurting with every step. I cut it short at about 1.5 miles. The day of painting went "okay". The worst was having to lean into the ladder. The subject has come up multiple times this past week -- do you remember where you were when "it" happened? Ten years ago today, the first terrorist act against Americans on American soil. Yes, I remember where I was, and what I felt. Clearly, as if it were yesterday. I can't even look at the images without feeling the same anger vreeping back in. I spent two days almost wishing some one would say we deserved it (as I had read online in several places) -- I wanted to vent 3000 lives of frustration on them. Labor Day has come and gone. With it, the last of the kiddo's are back to school, the last of the local bike road races are done (with visions of cyclocross dancing in the racers' heads), and my one and only tri for the season is in the books. My race this past weekend went well, even with some small things happening along the way. In the swim, I got clubbed pretty hard. First time that's happened in... I don't know how long. [No, I'm not suffering from memory loss...] And some one used my mini-pump before the race, and when they put it back, they put it upside down to what I'd had it, so it slipped down and was giving my hamstring trigger point therapy with every pedal stroke. But in the end it was a great race, and I surprised myself -- 6th overall and 1st in my age group. On the run portion, I was in a small group going up the hills, and the race had been so intermingled (sprint and Olympic), that there was no way to know who was doing which event... until the run courses split. And when that happened, I was the only one who went straight (onto the sprint course). I thought, wow... No one ahead of me? I kept going, upping my pace as I could. In the last straight, a 19-year-old passed me, and I could hear some one else behind me. I looked at the last corner, and there were 2 there... I pushed the last 50 yards as hard as I could, and held them off. So was I actually 2nd? Turns out there were 4 others ahead of us, up the road a full 3 minutes, so I never saw them. But for a little while, I could fool myself into thinking that I was leading the race. It felt good. Better even than the 5K I won earlier this year. In fact, it harkened back to a bike race I did in Wenatchee many years ago, that was a loop with a HUGE climb, which we did twice. On the first loop, I solo'd away from the pack, caught one other rider, and we made it over the top with a big gap. We held that into the second loop, and I solo'd away over the climb. All the way up, I kept telling myself that this is what racing is all about... I ended up 3rd in a 3-way sprint at the end, but going over the top of that second climb alone stands out as one of my most impactful racing moments. Anyway, I'll get the motorcycle tires and the school meeting out of the way today, hopefully, then get the house done over the weekend... Or at least before it starts raining.